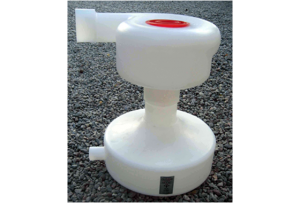 The aquatron is a simple plastic moulding that separates solids from flowing liquids - all without moving parts. In the case of a flushed toilet the solids are broken down to soil on a wormy composting bed in the chamber below the Aquatron separator, whilst the liquids are diverted to treatment or disposal as the local regulations require. 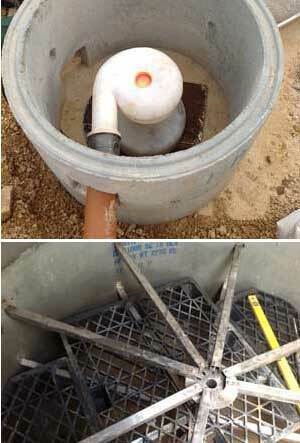 The solids are transformed by worms into a dark rich mass of castings which are incorporated into the local soil. We don't recommend that these are used on food crops as a precaution but for ornamentals and trees these are a real boon. The liquids are of a quality at worst equal with septic tank overflow and usually much much better. Above all the liquid has not had occasion to turn anaerobic and so is only as fragrent as it was when it left the house, and thus is ideal for open treatment systems such as vertical flow reed beds. These can then be combined with other Scandinavian innovations such as the Dubbletten urine-separating WCs or the Ifo ES4 standard WC, AirFlush urinals and other water- and nutrient-saving equipment for the highest green brownie points! 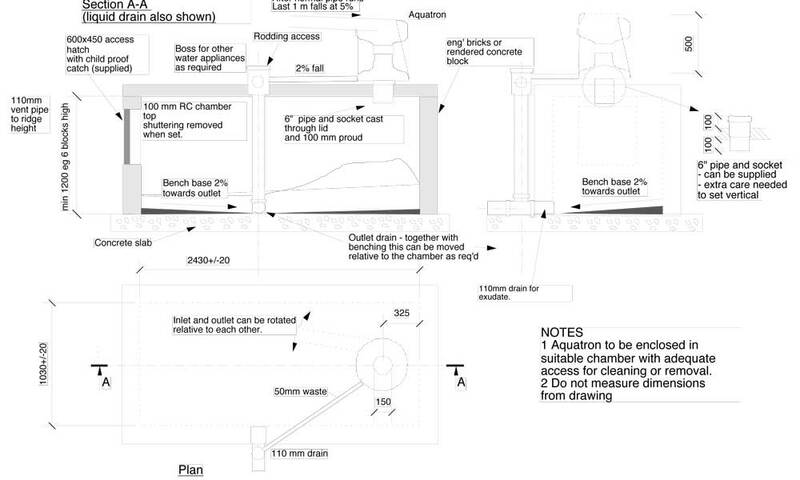 Over 50 Aquatron installations have been built in the UK in the last 15 years. The system is usually requested because of ecological concerns, to minimise odours, or because tankers cannot access the site to remove the sludge that would be created in a septic tank. 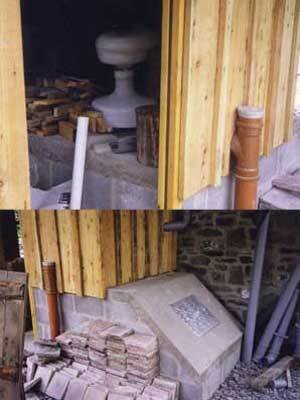 A converted building away from the main house needed foul drainage for its occasional lodgers. The space was below the existing septic tank and a new treatment plant would not get enough activity to keep the bugs alive. The breeze-block composting chamber just fitted in the basement and all was well. The system has functioned perfectly for over a decade and no one who uses the building has any inclination that the system, sitting right beneath their feet, is at all unusual. It is estimated that were a person to live there full time there would be a maximum of one wheelbarrow load of wormcastings created each year. 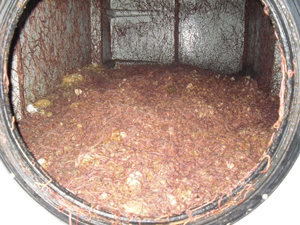 We are content that the composting chamber is larger than necessary because nothing is lost by having the extra volume and area. This ancient house just by the River Wye used to discharge directly into the river after an often-flooded septic. 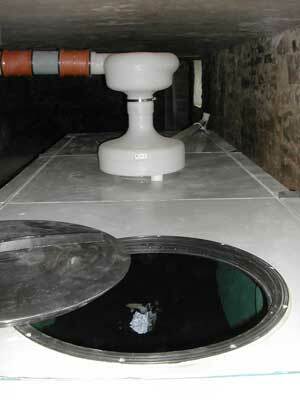 A GRP tank was placed in the cellar and bolted down to avoid floating with a one-way valve on the outlet. The separator sat mid-tank with doors at either end for maintenance. 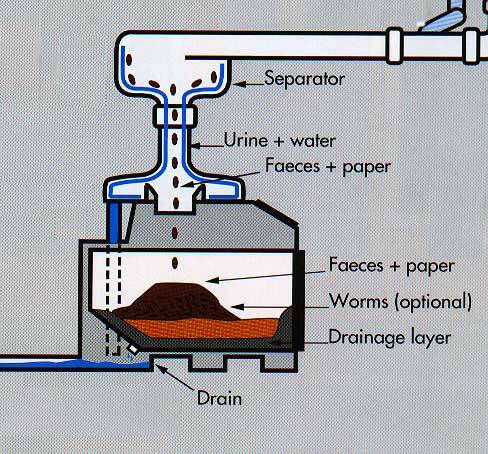 If a tank is flooded - in the case below because of a blackage of the outlet drain - the worms crawl onto the tanks walls. That's our workforce right there! This wildlife visitor centre needed a sewage system for an isolated toilet block. The tank is huge to accommodate all the bird-watching visitors. 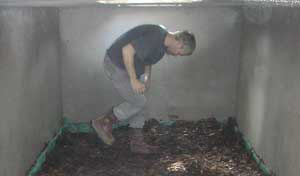 In this installation it is possible to walk within the tank as the worm-bedding is prepared. One can just see the green retaining netting over the HDPE pallets which act as a false floor for drainage and aeration. Not all buildings have a handy cellar or a slope beneath them to accommodate the composting chamber. We cannot assist all the places that don't. 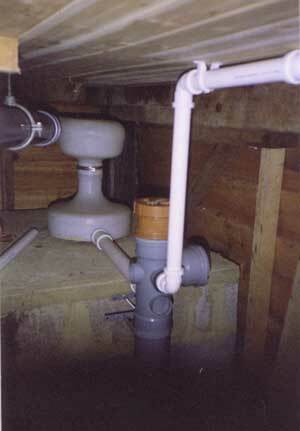 But this house had an upstairs WCs and so could use the Aquatron in a lean-to outside the building. The small and simple lean-to gives some protection to the HDPE separator, maintenance access, and space for logs and tools. The Field Centre, the nucleus of a new holistic university, needed good on-site treatment to minimise contamination of the ground water. The mother rock is a highly fissured limestone. Therefore, we went the extra yard by putting an extra filtering stage below the worm casts to clean even the filtrate of the very small proportion of the total liquid that goes through the worm bedding as compost tea. The worm bed and the underlying sand filter are suspended on a purpose built stainless steel frame, also enabling one to climb into the tank to maintain and harvest. These images and pdf downloads may assist in understanding and implementing the Aquatron system. We can sell the separator to those within the UK. (Other companies have the contract to sell the separator in other countries.) However, it is our experience that we need to discuss the fuller systems you can find on the price list together rather than making complete systems available here. 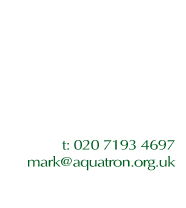 Aquatron (UK) is a trading name of Considera Ltd.
VAT number 879 5675 44.